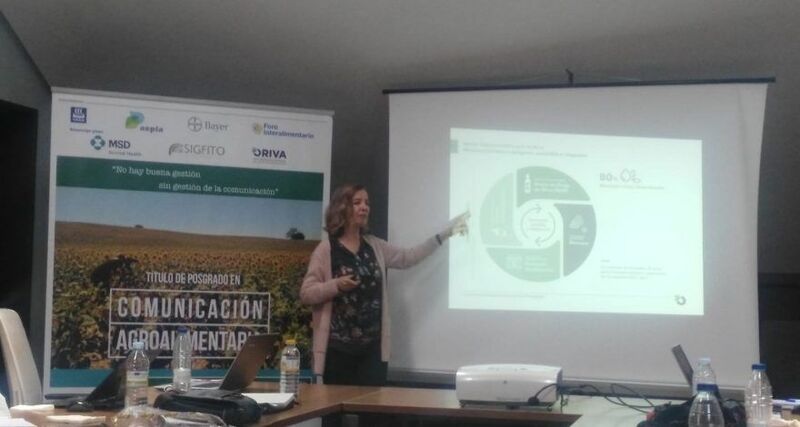 ORIVA participated in the fifth session of the University Expert Course on Agrifood Communications, created by the Association of Agrifood Journalists of Spain (APAE) and the Universidad San Jorge. The event was held at the headquarters of the Ministry of Agriculture and Fisheries, Food and the Environment in Madrid. Also participating were the General Director for the Food Industry at the Ministry of Agriculture and Fisheries, Food and the Environment, Fernando Burgaz; the General Director of the Foro Interalimentario food processing and distribution coalition, Víctor Yuste; and the head of the agrifood chain of the Spanish Association of Distributors, Markets and Supermarkets (Asedas), Felipe Medina. The General Director of the trade association, Alicia Vives, gave a presentation focusing on ORIVA’s communications, emphasising the importance of creating strategies adjusted to the public, and the challenge of dispelling false beliefs about Olive Pomace Oil. With reference to journalistic activity, she cited the need to raise awareness of the agrifood sphere.